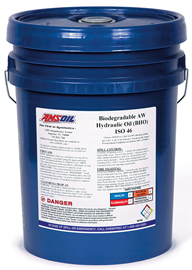 AMSOIL Biodegradable Hydraulic Oil ISO 46 is recommended for stationary and mobile applications using gear, vane and piston hydraulic systems operating under high pressure and temperatures up to 180°F. It should also be used where high biodegradability and low aquatic toxicity are desired. Typical applications include construction, logging and farming equipment, lawn and turf care or anywhere leaking, spills or ruptured hydraulic lines may present an environmental hazard.